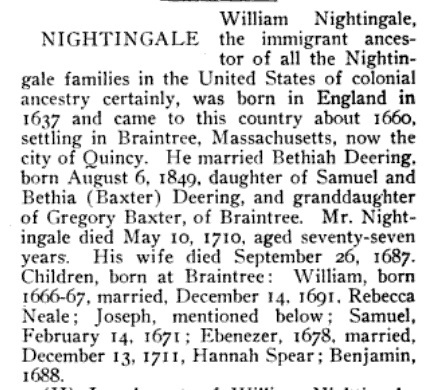 Samuel A. Bates, Records of the Town of Braintree 1640 to 1793, , at https://books.google.com/books?id=24Y-AAAAYAAJ . Randolph, Mass. : Daniel H. Huxford, (1886) , p. 692. 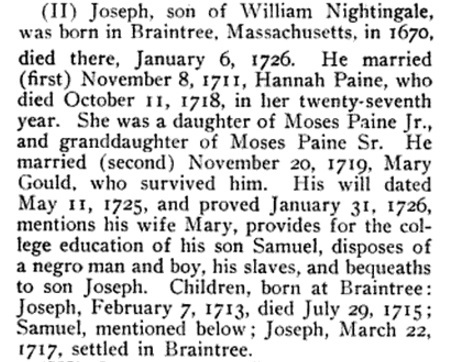 Samuel A. Bates, Records of the Town of Braintree 1640 to 1793, , at https://books.google.com/books?id=24Y-AAAAYAAJ . Randolph, Mass. : Daniel H. Huxford, (1886) , p. 750. Samuel A. Bates, Records of the Town of Braintree 1640 to 1793, , at https://books.google.com/books?id=24Y-AAAAYAAJ . Randolph, Mass. : Daniel H. Huxford, (1886) , p. 707. "Massachusetts, Town Clerk, Vital and Town Records, 1626-2001," database with images, FamilySearch (https://familysearch.org/ark:/61903/1:1:FHK6-14Q : 13 July 2016), Benjamin Weston and Sarah Ann Nolen, 09 Nov 1837; citing Marriage, Boston, Suffolk, Massachusetts, United States, , town clerk offices, Massachusetts; FHL microfilm 818,095. Allyson Norbut was born perhaps about 2003. Brandon Gage Norbut is online at https://www.facebook.com/profile.php?id=1762849372. Massachusetts Death Index, 1970-2003 [database on-line], Provo, UT, USA: MyFamily.com, Inc., ((2005)) , Certificate: 037661. Edward married Harriet Cowan Woodward, daughter of Howard Harlow Woodward and Rebecca Maude Keefe. Find A Grave Memorial# 2876005. Massachusetts Death Index, 1970-2003 [database on-line], Provo, UT, USA: MyFamily.com, Inc., ((2005)) , Certificate: 027980.